The #7240 HexPad Sliding Shorts are a pro compression short with low profile HexPads™ to protect the legs and buttocks from abrasions common from sliding. 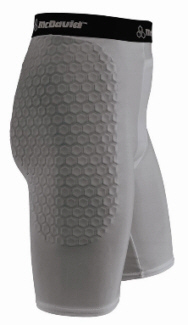 Patented lightweight, breathable, athletic foam conforms to and stretches with your body for continuous protection. Compression fabric supports large muscle groups to reduce muscle pulls and fatigue. Moves with your body to prevent skin irritations, chaffing, and abrasions. Includes our Ultra hDc™ Moisture Management Technology for heat control, comfort and performance. Includes a cup pocket. Inseam length: 8"
Colors Available: White and Grey. The Striker Soccer Sliding Short is a pro style compression short with HexPad™ Technology designed to protect the legs and buttocks from abrasions common in slide-tackling. The short conforms to and stretches with your body for continuous protection and comfort. Includes our Ultra hDc™ permanent Moisture Management Technology to enhance heat control and performance.